Send me a message if you want to use it !! 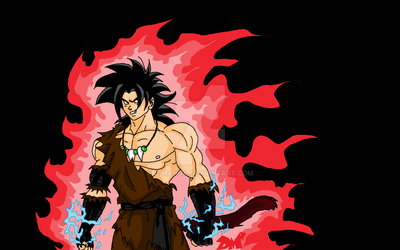 Now .... i find the time to adapted my sprite of kanba ssj in ... KANBA SSJ 3 fuuuuull powaaah !! His identity is very mysterious ... and he know a super saiyan god , possibly yamoshi ? But with certainly friends we read again the interview of toriyama about Yamoshi and ... yamoshi was the first super saiyan but not THE super saiyan god, or i read bad the interview ... it's possible. But i'm sure we don't saw Kanba in his full power ! For me he can use the super saiyan 4 ! ( he has a tail, can become golden oozaru ) i hope to see that in SDBH. to create that new version. Kanba say in the fourth episode of SDBH, " That red hair ? so, you're " He recongnizes someone but don't say a name ! and the unique other saiyan in super saiyan God that we know ( exept vegeta ) is Yamoshi ! so I can deduct that Kanba know Yamoshi. this is the version of Branba, my fusion of Broly ( 1993 ) and Kanba ! Thanks for the fav bro!